yes.........i hope you got a mathews I am the bow hunting king..........what you want to know?? I didn't get a Mathews because I didn't want to spend $700+ but I did go with one of the new PSE's that Ive heard really good things about. Well I'm looking for the best sight I can get, arrows, and such. yup...same here. On paper all stats looked similar...but the PSE was half the price....and for my first bow I didn't see a point in spending too much money. i use a five pin tru-glo but there are lots of good sights on the market. as far as arrows in my opinion there is only one..........easton full metal jackets decked with bohning 2 inch fletchings. broadheads...... i shoot the 3 blade rage but some don't like the mechanical blades. i have no problem with them and they will cut a large hole. I'm running the Tru-Glo 5 pin as well. I like it. Good info, I'll have to check out the tru-glo, thanks. Sorry for the poor pic quality. Only had my cellphone to take the pic. Swine Flu Eradication Program....I LIKE it!! I'm going to do my part as soon as I get home!! Nice rig too....EOtech on top.....good stuff. 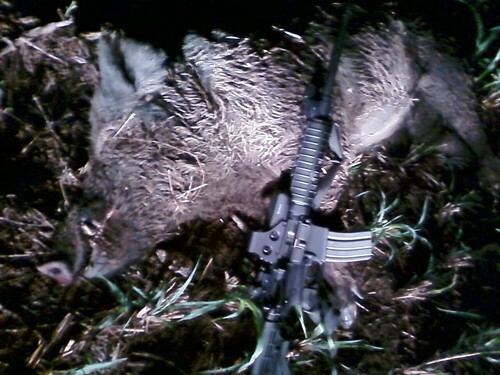 I've had the same argument w/ friends as well about a 5.56/.223 not being enough gun for a pig. Hell...I know a guy who hunts em w/ an AR conversion w/ 9mm upper and a suppressor. A friend of mine also told me one year that my .22-250 would not kill a deer. (He shoots a 7mm....not to be confused w/ a 7mm Mag). So to demonstrate my theory on how "speed/velocity kills"....we set up some steel plates hanging from a low branch in a tree. He shoots and knocks the plate out of the tree. He shouts and gives a fist pump. My turn. I chamber one...fire......and he yells "YOU MISSED".....to which I said..."no I didn't" We walked down...and sure enough, it had gone clean through...but did so w/ such velocity, it didn't even make the plate move. With some of the lighter loads (45g) I've been able to shoot empty soda cans on fence posts w/out making them move. I LOVE FAST, FLAT SHOOTING ROUNDS!!! My deer rifle is a .25-06!! I agree, I've shot plenty of hogs with 5.56/.223, alot depends on the weight of the bullet and where you place your shot. I have some 37g RBCD blended metal rounds that will knock a hog straight to the ground. I've seen plenty of people take down deer with some very fast light rounds too, .204, .22-250, ect. I always buy the cheap Remington UMC in either 55gr FMJ or 45gr HP when shooting my M4. I am an old fashioned .30-06 man... M1, 1903, REM 700... (I like .30 cal... I shoot those already mentioned plus M1 Carbine, SKS, and Moision). Funny you should mention that......I recently added a Kahr/AO M1 Carbine to my collection......for the sole purpose of it being my brush/hog gun! LOL. I would not have believed it with the drought we are having but I checked the oak trees in southern San Saba county and a lot of them are covered in acorns. I know, stress a tree and they will deliver, but that has not always been the case. Acorns are really coming out now in Wise County... very interested to see what happens with all the rain we recently got..